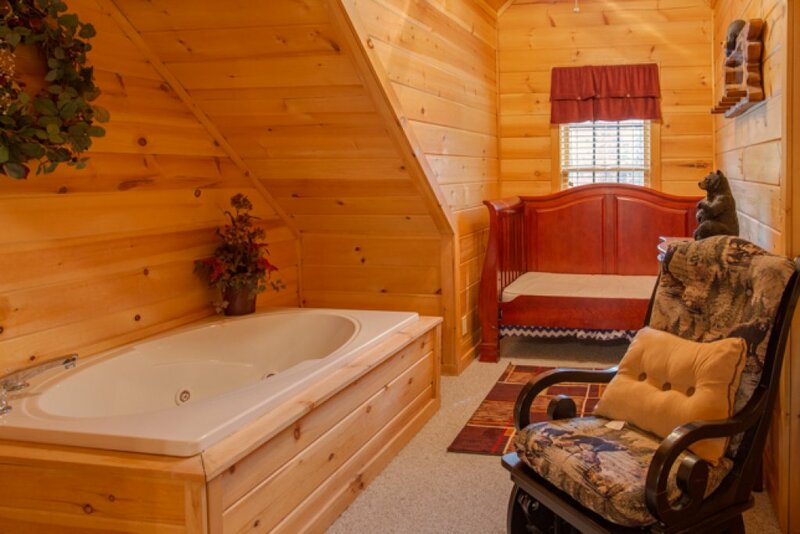 With three en-suite master bedrooms as well as two sofa beds, Peyton’s Hideaway is a great home base for several couples or families who want to enjoy everything the Smoky Mountain area has to offer. 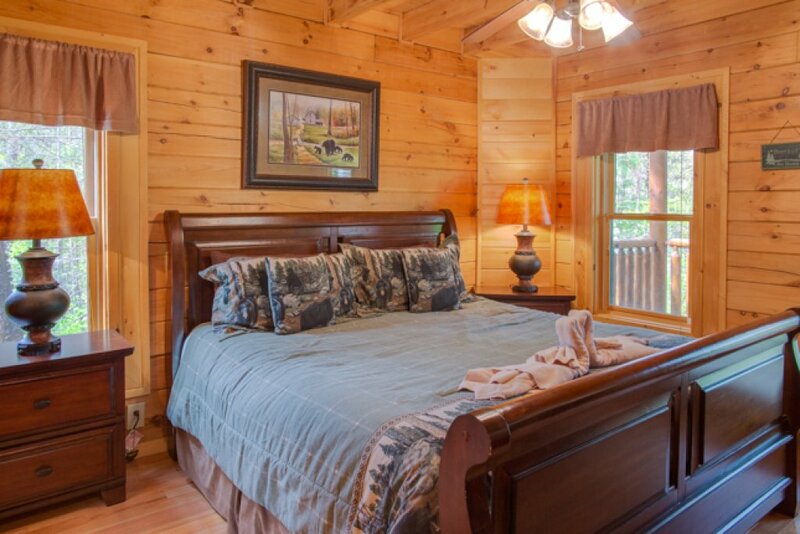 Not only is the three-floor log cabin packed with amenities, but it’s also less than two miles from downtown Gatlinburg and only minutes from the Great Smoky Mountains National Park. All that, and it’s pet-friendly too! The serene location makes it easy to forget just how close to attractions, restaurants, and shops Peyton’s Hideaway is. 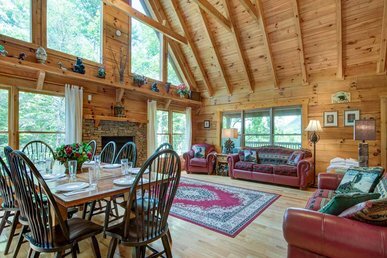 When you’re not playing with the kids on the front lawn or exploring the surrounding woods, you can revel in nature’s sights and sounds from the two huge covered decks. 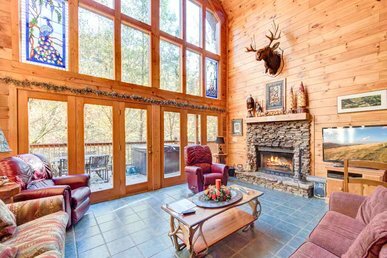 You’ll find plenty of log-style rockers (a must for a true Smoky Mountain cabin), and the main-level deck even has a fireplace, ideal for gathering around as you enjoy after-dinner drinks on chilly autumn evenings. 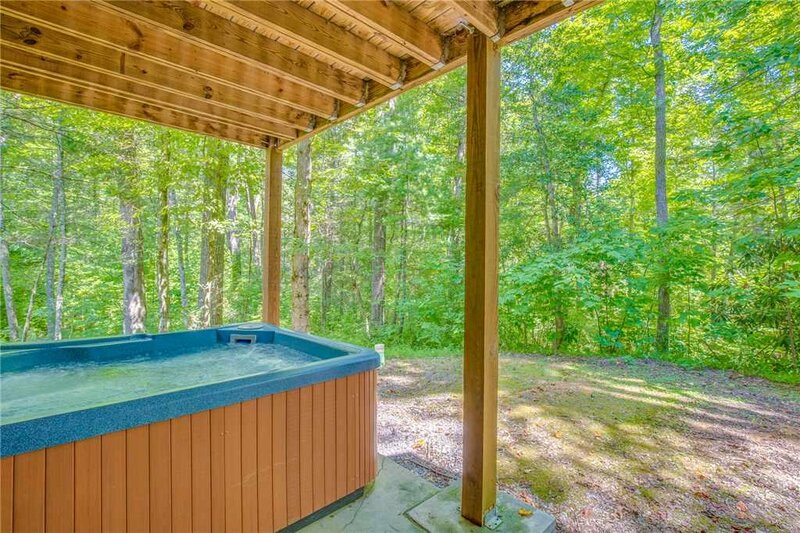 Perhaps the only better spot for soaking up nature’s beauty is in the patio’s six-person hot tub while you’re literally soaking in steamy jets of water. 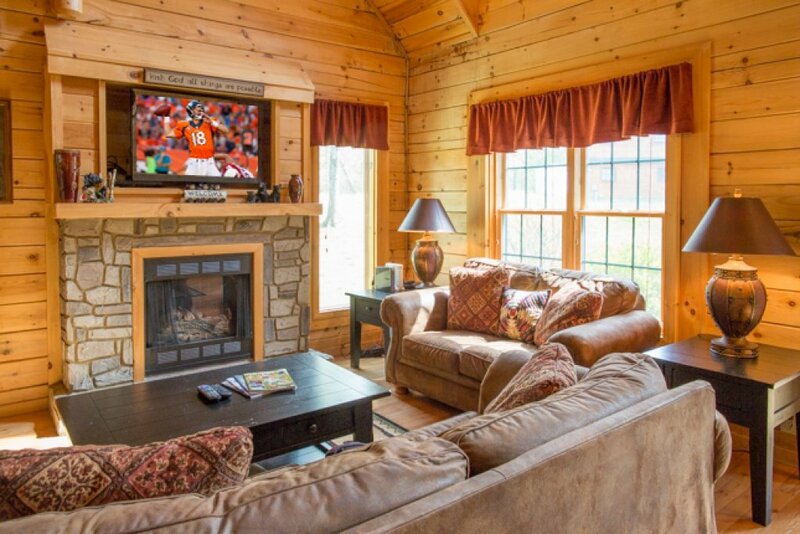 At nearly 3,000 square feet, Peyton’s Hideaway offers plenty of spaces where everyone can gather together, along with nooks where you can slip away for one-on-one chats or private time. 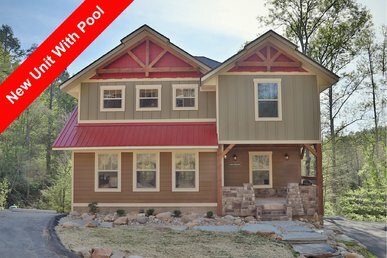 With wood-planked floors and walls, a vaulted ceiling, plenty of windows to let in the sunshine, ceiling fans, and in the living area, a stone-surround fireplace, the home looks exactly as you’d want a mountain retreat to look. The open-plan living area on the main floor includes a 47” flat-panel TV and lots of plush seating so that everyone can watch a movie together. 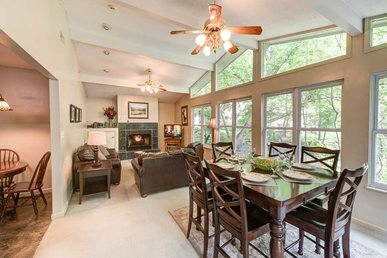 The adjacent dining table seats six with ease, and there’s room for two more at the breakfast bar, which doubles as the kitchen island. 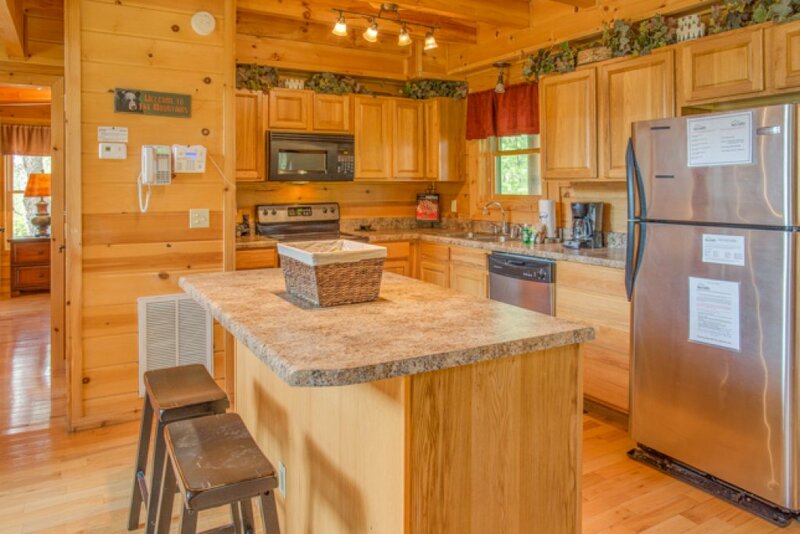 The recently upgraded kitchen features stainless-steel appliances, cookware, tableware, and plenty of counter space. 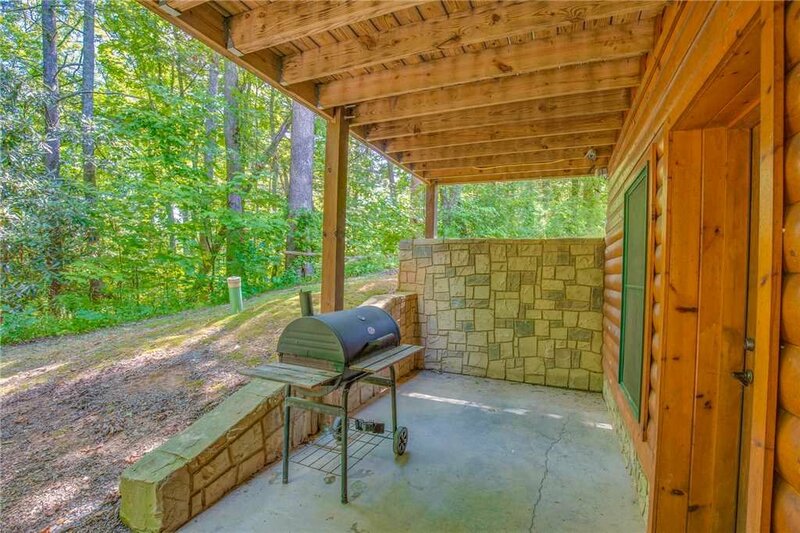 The cabin has a charcoal grill on the patio as well, should you have a hankering for home-cooked barbecue. Downstairs houses the cozy home theater. With just three amply padded cinema-style seats and a 50” screen, it lets you enjoy a truly private screening. 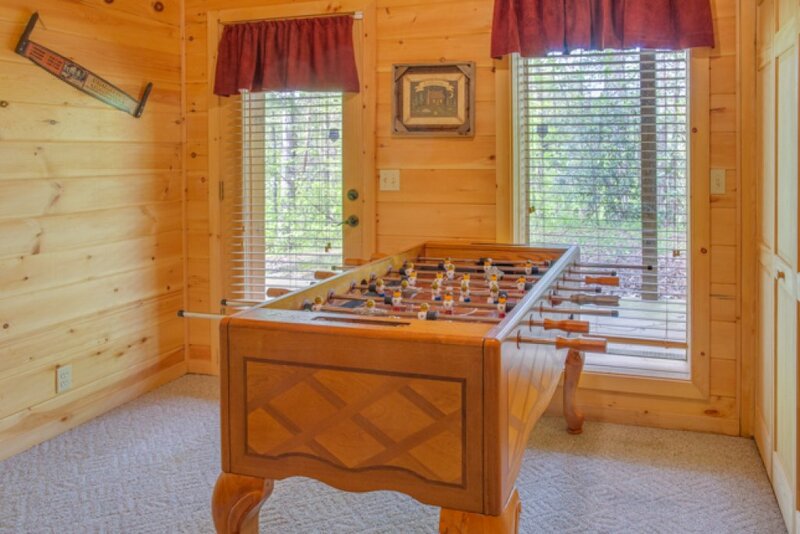 Also downstairs is a small room with a foosball table. For more fun and games, head to the top floor. 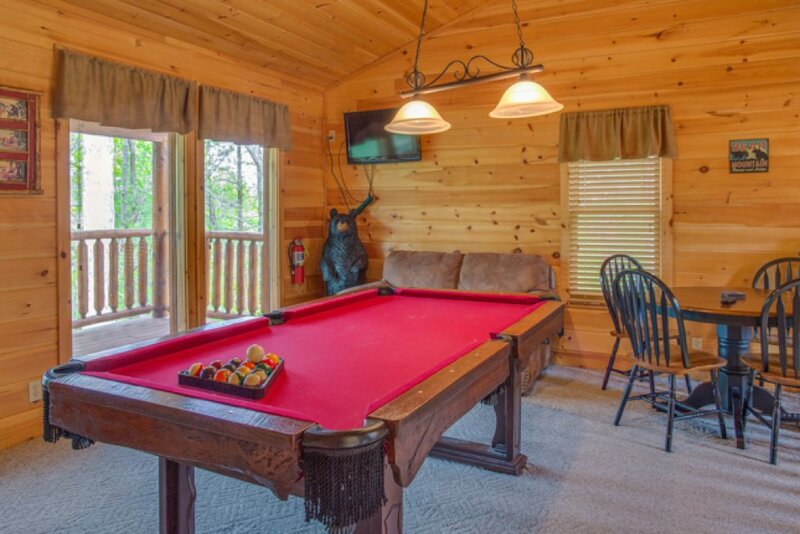 Its game room includes a pool table, a card table, and another 47” flat-screen TV. It’s like having a private after-hours club in your own home. 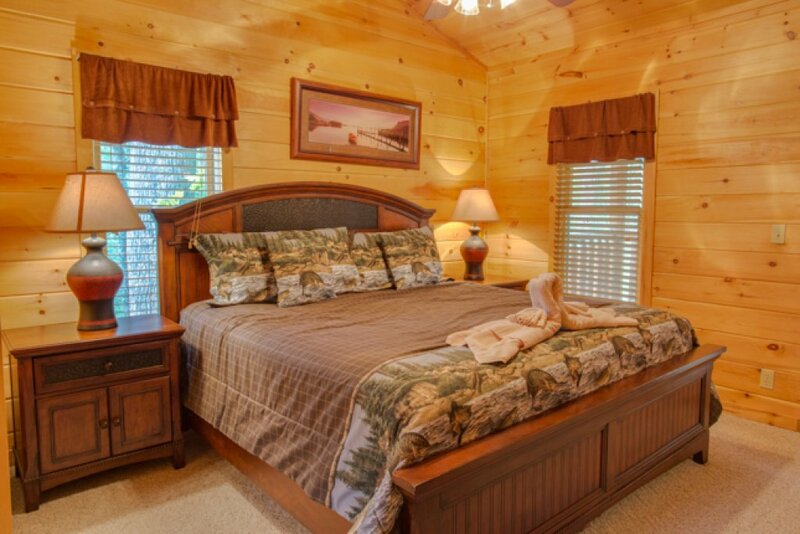 Each floor has a handsomely furnished master suite. 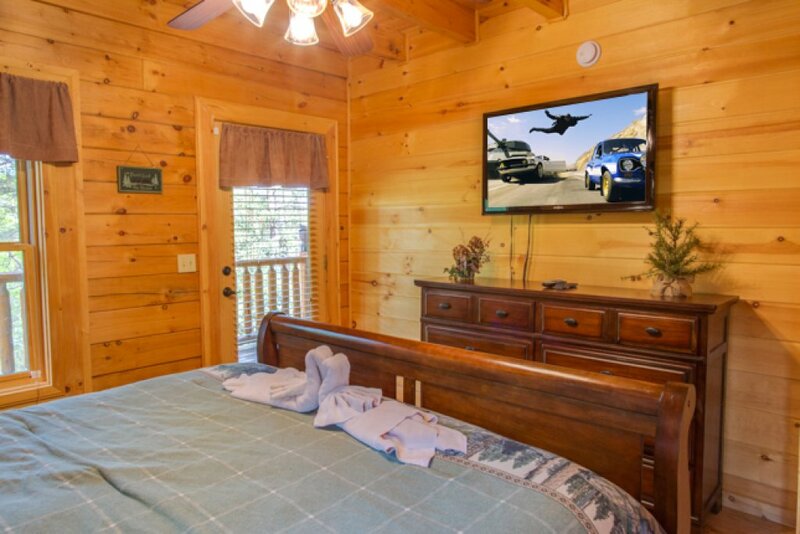 In addition to a marvelously comfortable king-size bed, each suite includes a 47” flat-screen TV, a private bathroom, and a ceiling fan. The upstairs suite also features a luxe sitting area with a Jacuzzi and a rocker, and from the bedroom, you can step out directly onto the top deck. A second indoor jetted tub is in the main floor’s en-suite bathroom, and the main floor’s bedroom opens directly onto the main deck. 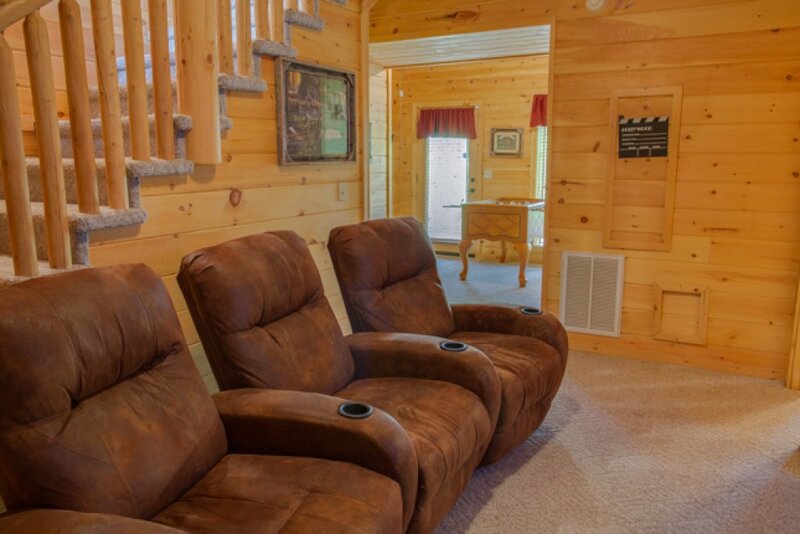 If you have more guests, the sofas in the living area and the game room open into beds that can each sleep two, so that Peyton’s Hideaway can accommodate ten overnight guests in all. 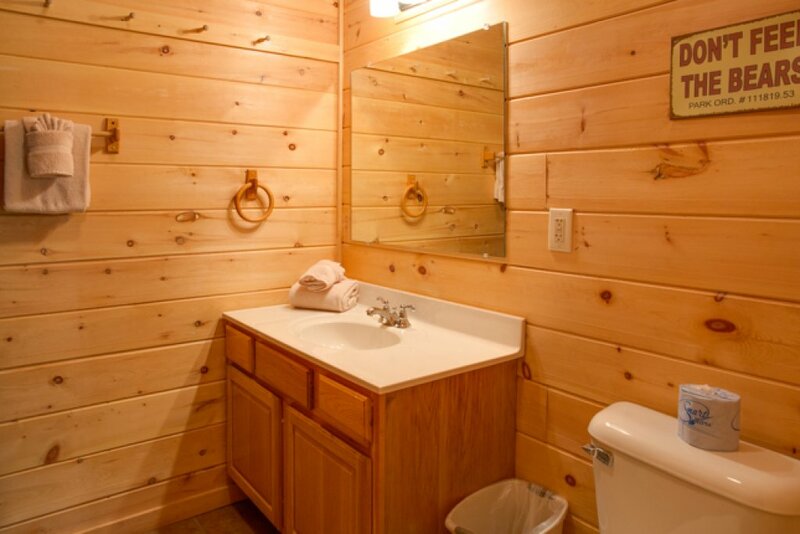 For added convenience, the cabin has a half-bath in addition to the three full bathrooms, plus free WiFi and a garage. 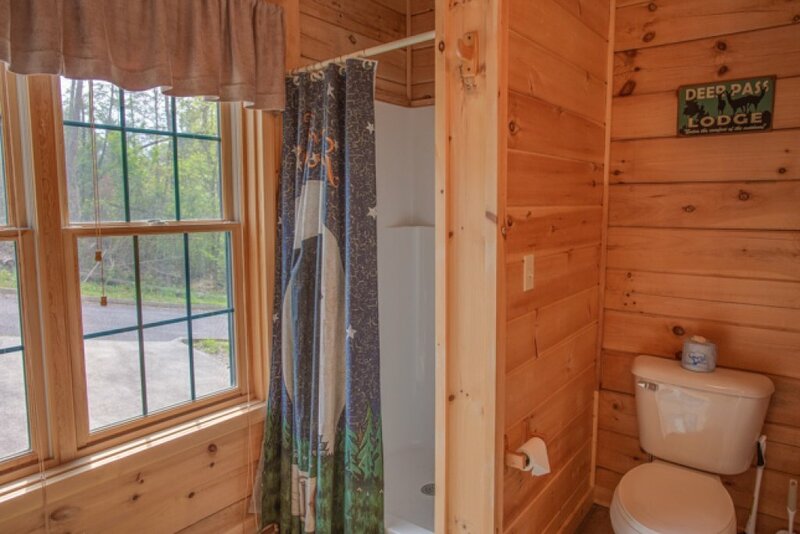 The cabin’s greatest convenience of all, however, has to be its location. In just five minutes you can drive to downtown Gatlinburg, home to an aquarium, the Guinness World Records Museum, thrill rides, and more. 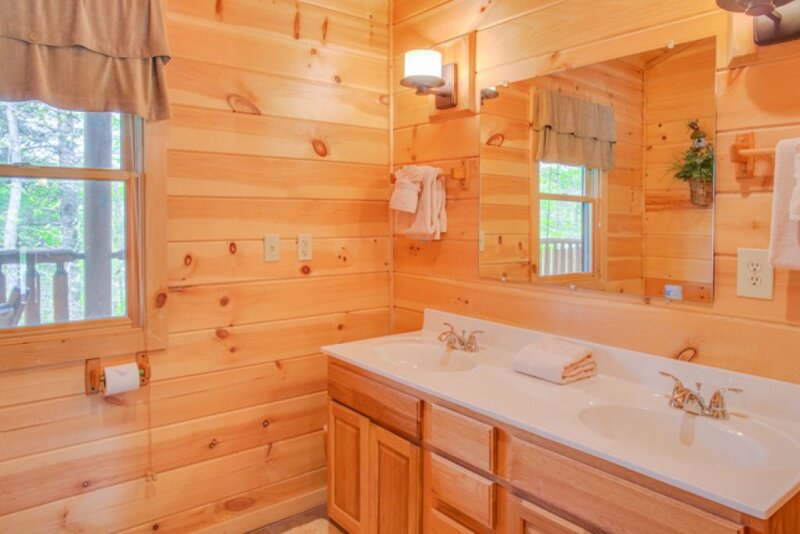 Also nearby are Ober Gatlinburg Amusement Park & Ski Area and the country’s most popular national park. Just slightly farther afield are the delights of Pigeon Forge, from Dollywood to outlet shopping. 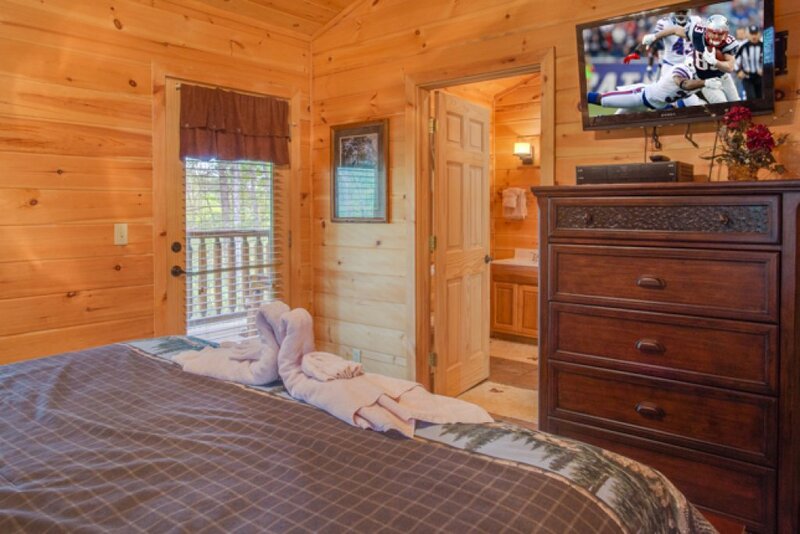 Whether you prefer being on the go or relaxing in a low-key way, you’ll love Peyton’s Hideaway. So go ahead and book your stay today; we’re looking forward to seeing you. Please note: Some construction is in the area. Liked the three levels. Worked out well for our family. 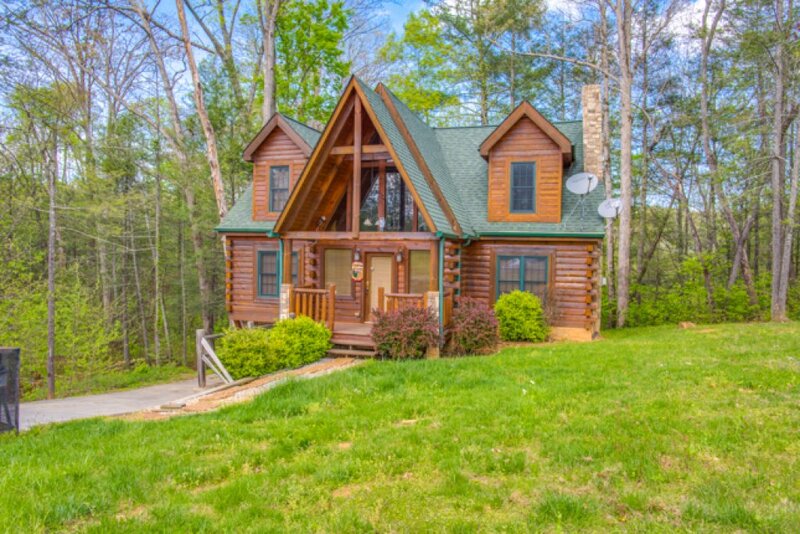 Great location close to Gatlinburg. We had a bear visit that was awesome! We had a few issues when we got there but staff responded quickly. Very impressive considering all the devastation that had taken place the week prior. The cabin was nice but I expected a little more. Low on kitchen supplies. We did enjoy our stay and are so glad Gatlinburg is recovering. One of my favorite places in the world. The family enjoyed it! 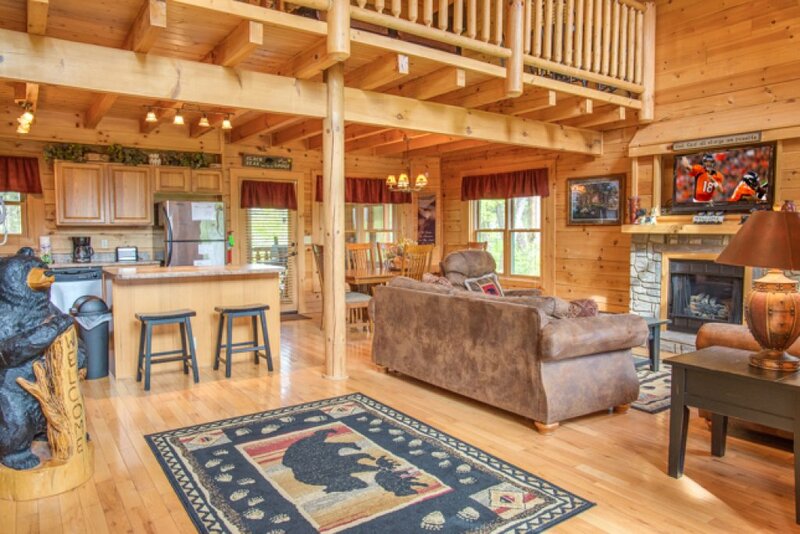 Peyton's Hideaway is a beautiful luxury cabin in a great location. Loved having a bedroom suite on each floor which provided privacy for everyone. Cabin was clean and furniture was comfortable and in good condition. We look forward to staying here again! 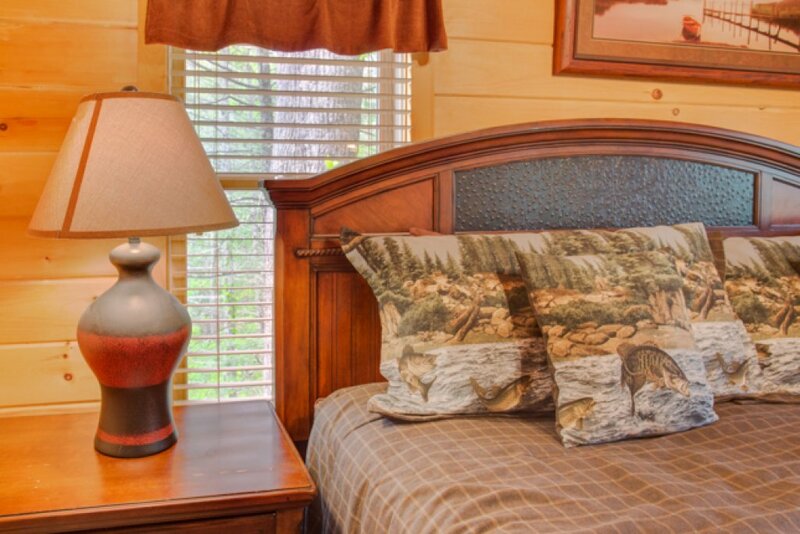 Lovely stay- but. . . . . . . .
We LOVED the ease of working with Smokey Mountain Rentals. Fast responses, VERY organized! We LOVED Peyton's Hideaway. 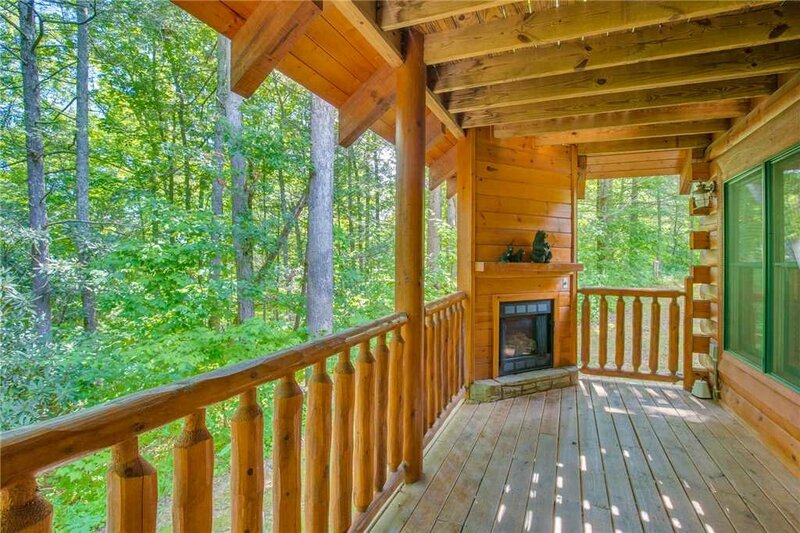 A beauty of a cabin and loved the decks, fireplaces, and wooded area. So why the but. . . It's so sad seeing a beautiful cabin like this not being taken care of and I can't help but wonder if the owners know its problems. The cabin has 2 bad leaks in the living room area because you can see the damage stains running down the walls. 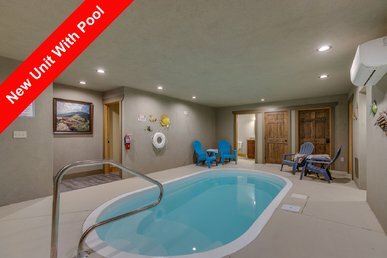 The hot tub was moved to the lower level concrete porch because it was rotting the main level rafters where it use to sit. It needs a major deep cleaning, Windows, dust on greenery above kitchen cabinets, spider webs, and a good mopping. The beds were VERY comfortable. Showers and tubs clean. Kitchen was clean and supplies were adequate, plenty of living room seating. We never could get the TV's to get signals in the upstairs bedroom and main floor bedroom. Don't know if that was operator error or not- but we did have two technology guys in our group and they could not get it to work. Wifi Good. Loved the hot tub and grill, but locations not so much. Guess that's personal preference. The members of our family that stayed in the downstairs bedroom said the bathroom smelled bad (sewer) at times. Even tho there were some run down imperfections starting at this beautiful cabin we enjoyed our stay. The location was GREAT, easy to get to, but the picture makes you think its a level driveway, it is not. It is a short fairly steep driveway, but does have a garage you can use. It is private, only one other cabin on the road. We had a bear visit our first day. He was walking through the yard! That was fun. Thank you for the four-star review and the positive comments about our management company. We will be addressing the maintenance issues, but the exterior porch issue had already been addressed and approved by the City of Gatlinburg. We hope to have you back in the near future! An excellent enjoyable trip in spite of the hurricane and extra traffic. 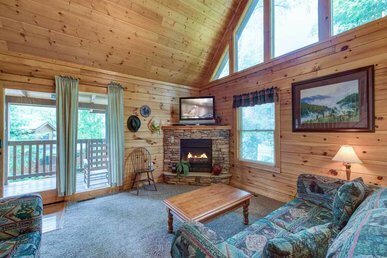 Thanks for the five-star review and positive comments regarding your recent trip to the Smoky Mountains! We hope to host you again in the near future! PLACE WAS VERY CLEAN AND UPDATED. PERFECT LOCATION. 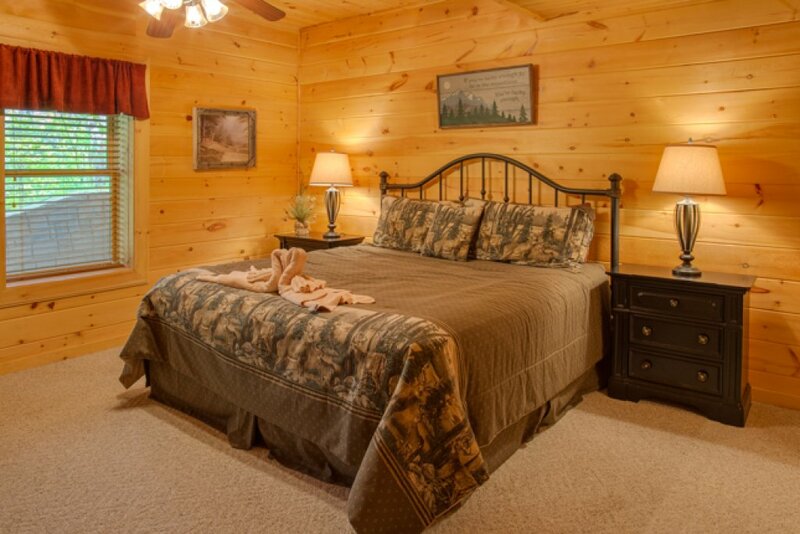 JUST 5 MINUTES FROM THE MAIN STRIP IN GATLINBURG AND PIGEON FORGE. WILL DEFINITELY BOOK AGAIN. THE FAMILY LOVED IT AND IT WAS SO MUCH FUN. 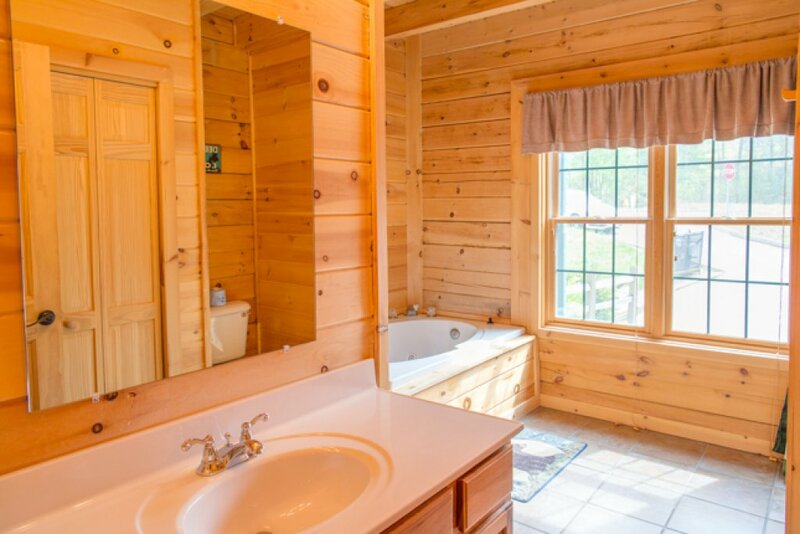 The cabin is beautiful! Every floor has a bathroom with a shower/tub! Very nice layout! 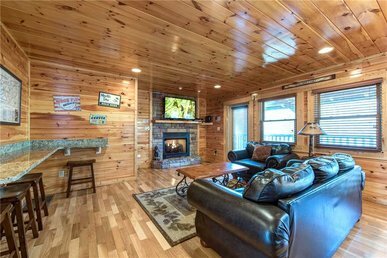 The cabin was very clean and in a great location in Gatlinburg, not too far from the strip, but fat enough into the mountain! I will definitely be staying at this cabin again!!! 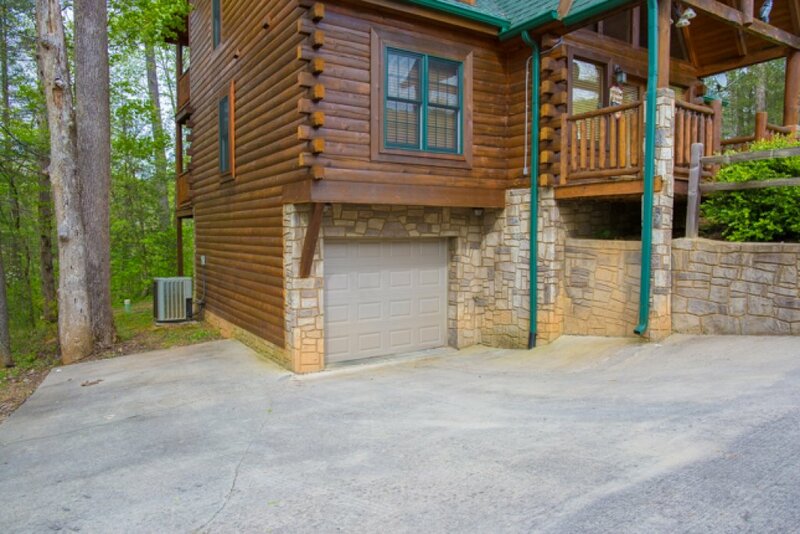 Quite a disappointment compared to other cabins we have rented in Gatlinburg. Sleeps 10 people-had 6 dinner plates, shelves on refrig broken, 1 broom, no working vacuum, grill on bottom floor, dirty patio. air went out, filters were filthy, house leaked in 2 areas. Thank you for your feedback concerning your recent stay. I am sorry to hear that the property fell short of your expectations. Based on your feedback, we will bring the kitchen stock up to speed. We have also followed up with housekeeping. I wish you had contacted us on the 24/7 guest hotline with any issues so we could have promptly resolved. Thank you again for staying with us and come back soon! The stay was great. I rate the cabin and the visit a 10 star. Everything was perfect. The cabin was on points on all levels. I lovvvvvveeee this place and recommend everyone at sometime in their lives to visit. The hospitality was great throughout the Gatlinburg, TN. Simply love the people, the place, and the mountain. We stayed at Peyton's hideaway rental cabin the last week of June 2016. 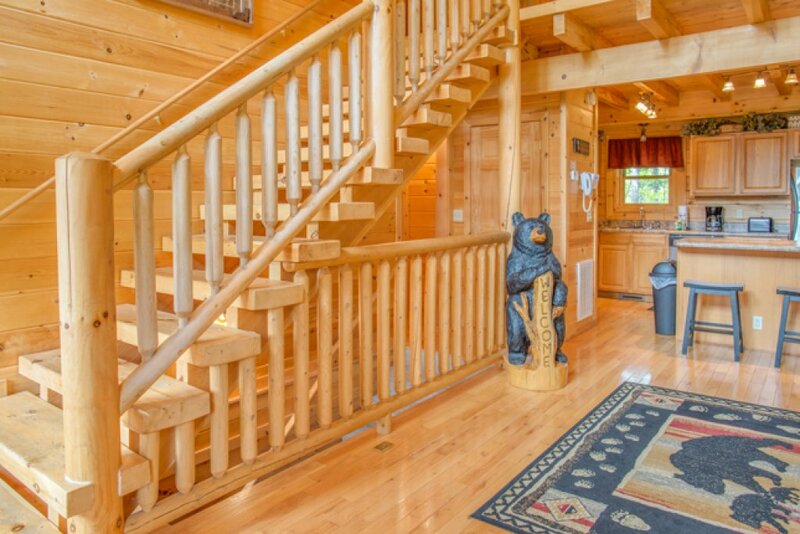 The cabin is beautiful inside. 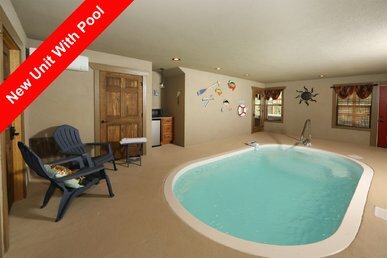 Spacious rooms, bathrooms for everyone, comfortable beds, couches, etc. The pool table and fuseball table were nice amenities also. we didn't use the garage or the outdoor fireplace. The kids went in the hot tub one time. As far as location, it was okay at best. There's no "view" no lake or steam, we saw a few deer but nothing great outside the cabin. It was pretty much a glorified hotel room for us for the week. We have 4 kids so we had a busy week planned anyway but it would of been nice to enjoy a day at the cabin but there wasn't anything to do outside and not much more then a few games and TV inside. 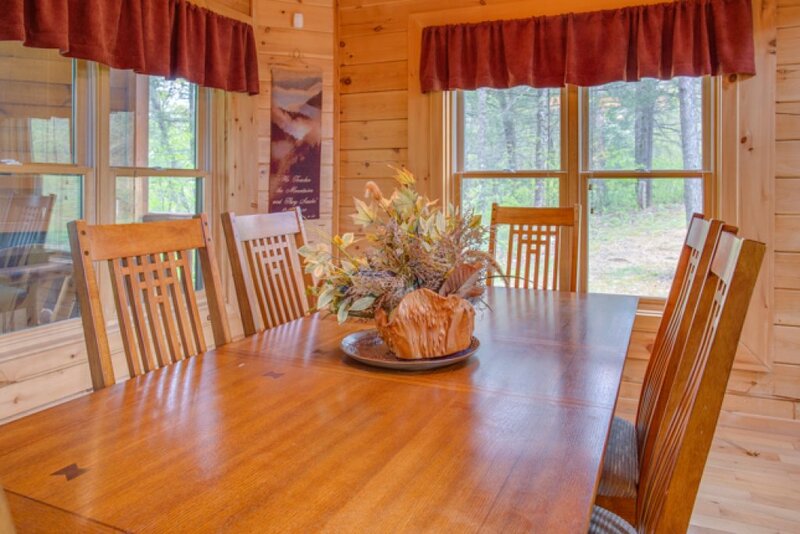 If you are looking for a cabin to relax (without kids) at, it's great if you stay inside but not outside. 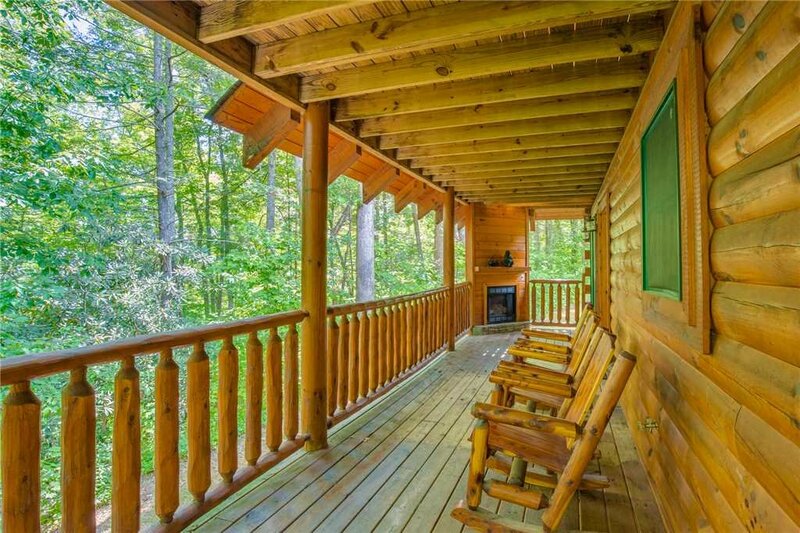 We enjoyed the entire week in Tennesee but I would most likely find a cabin at least with a view if not somewhere else that offers outside things to do next time down. Thank you for your review and comments! 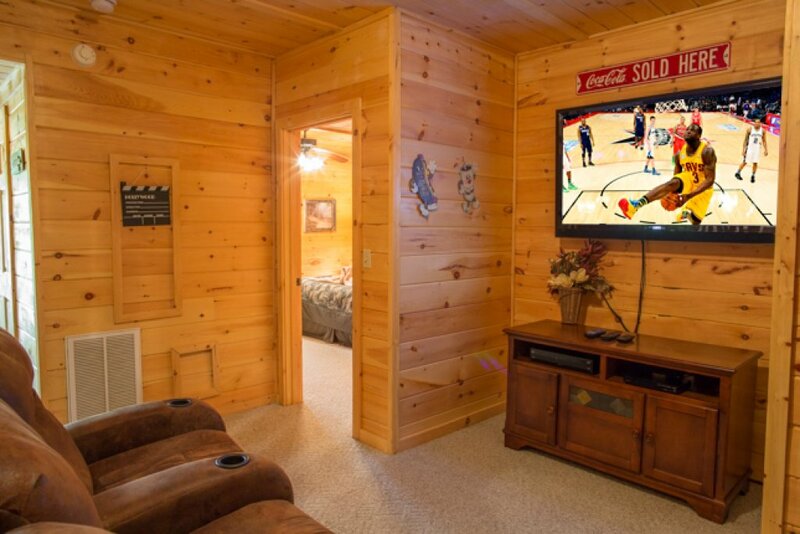 I am sorry to hear that you were expecting a mountain view - the selling points of this property are seclusion, yard, upscale property, and an easy to get to location near downtown Gatlinburg (5 minutes from the main Parkway). 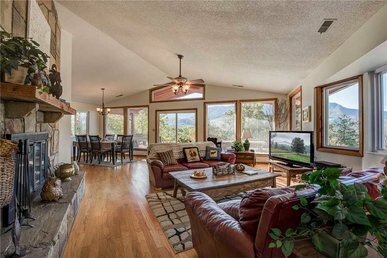 This property does not have a mountain view and is not advertised that way. Thank you for commenting on how nice the property and amenities are. We work hard to ensure these are in great shape for our guests. We hope to have you back again in the near future. The property was very clean and well-maintained. My family really enjoyed the property, everything that we needed was there with the exception of an iron. The gameroom area was very roomy and all rooms had nice 42 inch flat screen tv's including the lounging area. I really enjoyed myself and was able to take beautiful pics. Thank you for the five-star review and comment on how clean the property was! We look forward to having you back very soon!